Dye Sublimation has the highest print quality for printing on fabric/textiles. Dye sublimated textiles are very durable and can be laundered without any concern of them losing their appeal. UV inks are guaranteed between 3-5 years however we recommend indirect or North & Eastern exposures in extreme climate conditions. Textile art for outdoor garden or indoor spaces. Create a focal point on a bare wall, add colour to a shady corner, screen a view or cover a railing. 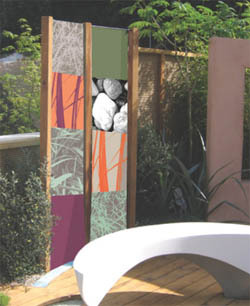 Feel free to have a peek at our amazing outdoor banners. Perfect art for your backyard, for your urban garden, for your balcony, the restaurant, the hotel...Hang as an individual piece or group in three. Designs are individually produced to custom sizes and may be formatted vertically or horizontally. For matching waterproof outdoor cushions have a look at our outdoor cushion page. The only limitation is your imagination! We encourage all customers to try to see these products in person whenever possible. The digital pictures we display have the most accurate colours possible, but we cannot be responsible for individual monitor settings. Please visit our showroom, to make the appointment contact us. Price is per m2.